If you haven’t noticed, I am big on using the Science and Engineering Practice of Analyzing and Interpreting Data. It is definitely one of the practices I gravitate toward, and I find myself easily incorporating it into my lesson and unit plans. (On the other hand, Using Mathematics and Computational Thinking, now that is a different story!) One of my favorite Earth Science activities has students graph seismic waves as a way to discover that the Earth has layers. Back when I was in school and we learned about Earth’s structure, the lesson looked something like: “Hey student, the Earth has layers just like this hardboiled egg. It has an inner core, an outer core, a mantle, and a crust. The end.” Or maybe they added in, “Well, there’s the lithosphere and the asthenosphere and…” Either way, it was always very cut and dry, we typically drew (or colored) a picture, and no one really questioned, how do we know!? I remember randomly thinking one time in college, how do we know what’s inside the Earth? and then I spent a chunk of time afterward Googling to find the answer. I don’t think I understood much of what I found, because I recalled the question a few years later and couldn’t remember the answer. Until I found myself teaching an NGSS-aligned unit to meet HS-ESS2-3: Develop a model based on evidence of Earth’s interior to describe the cycling of matter by thermal convection. Yah, it was time to figure this one out for good. As I explored this topic on my own, I discovered the role of seismic waves in helping us understand what Earth’s interior is really like. By studying seismic waves, scientists have determined not just the number of layers but also their depths and the state of matter they exist in. And the great thing is, students can use seismic waves to discover these ideas, too! Before diving into this activity, I challenge my students to engage with the content by trying to figure out what might be hiding inside a mystery egg. The trick is… they can’t touch it (so shake it, throw it, open it, break it, so on and so forth) or really do anything to it at all. How can they figure out what’s inside? This is quite a puzzle, and most of the time, my students just got frustrated. This is where the graphing seismic waves activity comes in. I do preface this with some background information on earthquakes – typically just a text or video. Earthquakes are not my focus in this unit, so I don’t want to spend too much time “exploring” them. My goal is just to provide the necessary information to really understand what seismic waves are, maybe a bit about how we track them. Just the basics here. Then, students dive into the data to create their own graphs. I have found my ninth graders really struggled with this skill, so I actually split my class in two for this activity. Half of the class works independently at stations in the back, while I work more closely with the other half. This allows me to provide much greater support to those lacking graphing skills (like the very basics of setting up your axes, plotting points, and connecting the dots). Beyond that, the analysis itself can be a bit complicated for those still getting their brain around this type of learning, so working together as a smaller group to analyze the data initially was beneficial as well. I used one of my favorite data analysis strategies, “What I See, What It Means,” to help students analyze their graphs — identifying patterns (hey there, Crosscutting Concept!) and using those patterns to draw conclusions. For my analysis worksheet, I use a setup similar to that found in POGILS (Process Oriented Guided Inquiry Learning), where students are guided through the activity with probing questions, provided additional information in a step by step manner that adds to their understanding, and asked to draw conclusions and really discover the big ideas themselves. 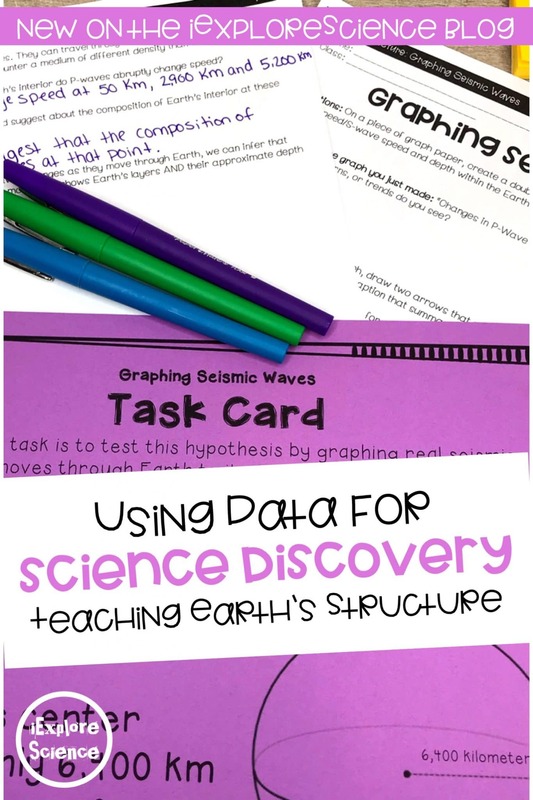 Through this activity, students discover how tracking the speed of S and P waves allows scientists to identify how many layers Earth is made of, as well as the depths of each layer and what state of matter it exists in. They then use this data to create a visual of Earth’s interior – a model really – and throughout the unit, they add details to this model as they obtain additional evidence about the structure of Earth. This method of teaching the structure of Earth’s interior is about a bazillion times more engaging than a boring slideshow and lecture, and it truly engages students in doing science to learn science. Students are working with real world data to truly discover something, and that process is a way better teacher than me or you.